Promoted by Jamie Lynn Spears. A portable karaoke set that includes everything you need to perform like a pop star. Includes a player that is worn on your belt, a hands-free headset microphone and a song cartridge. Requires four AA batteries. Ages 6 and up. 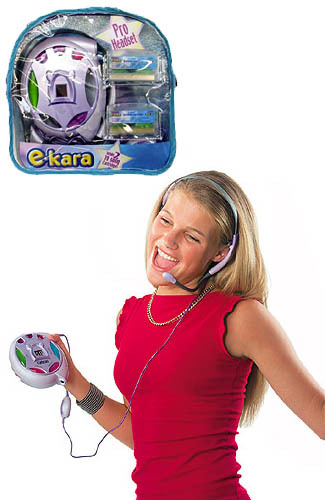 E-kara is the first truly portable handheld karaoke system that simply plugs into a television. This main unit includes everything needed to get started: a microphone with features, wires for fast and easy television hookup, and a cartridge featuring five songs from Britney Spears, Destiny's Child, Backstreet Boys, and the Beatles. The product offers great music quality and easy setup allows singers to start the fun right away--all you have to do is plug the E-kara microphone into a TV, pop in a cartridge, and pick your favorite song. Lyrics will appear on your TV screen while you belt out the tunes! E-kara also includes great features that let you add echoes (sing in the shower or from a mountain top), change tempo, and more. The best part is that you can take it anywhere. This Gift Pack Includes The Main Unit, Carrying Case and 2 Cartridges.